Do you need to partition a big office room into smaller offices for your employees to work more efficiently and have a more pleasant working environment? If so, then look no further than Mallforms for your office wall needs. 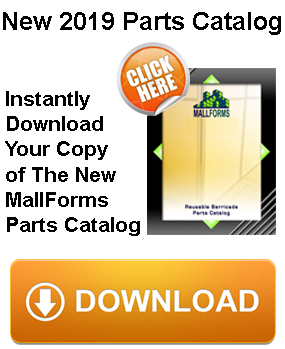 Mallforms has a cost effective, easy to setup, and flexible office partition wall solution for you. 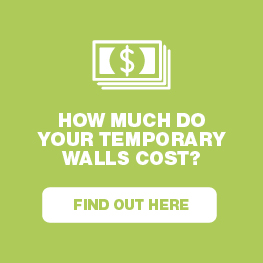 Business owners and managers, in multiple industries absolutely love and have been using the temporary walls for over the past 28 years we’ve been in business. 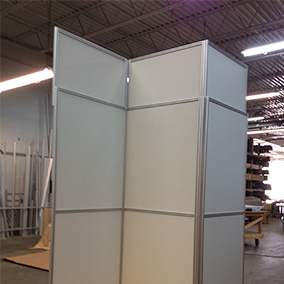 The walls are made with an aluminium framing in a satin clear anodized finish with infill panels that are ¼” thick in either an MDF core with an off-white vinyl laminate on both sides or solid PVC. 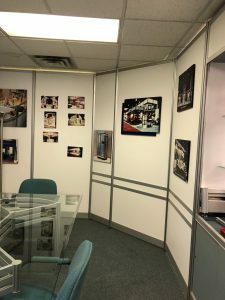 Now let’s look in more details at just 6 reasons why Mallforms temporary office walls are the very best solution for your office wall needs. 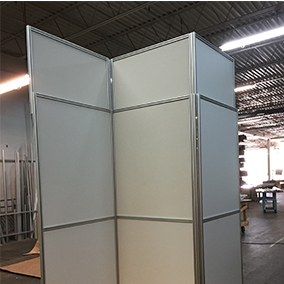 Our temporary office wall dividers are very flexible and will allow you to easily change their configuration quickly and with minimum effort whenever needed. 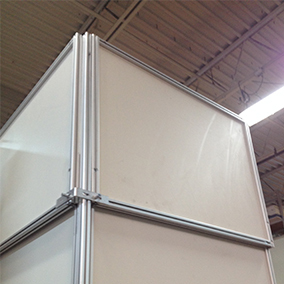 They are lightweight and modular, it’s so easy that anybody can do it, so no need to hire a contractor to modify the wall layout. #2: Quick & Simple – Our Walls Only Take One Tool! 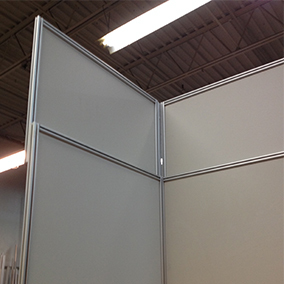 We know that there is more than enough work already going on in the business, so that’s why we designed our walls to be easy and fast to set up. It literary only takes one screwdriver (that we even supply to you) to set the walls up – that again is super simple and quick to set up – without any hassles, so you can get back to work quickly with increased focus and productivity. 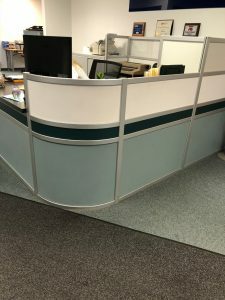 We take pride in offering the highest quality of walls that maintain the professional look and durable strength for years (we literally have some customers that have been using our office wall partitions for over 20 years). 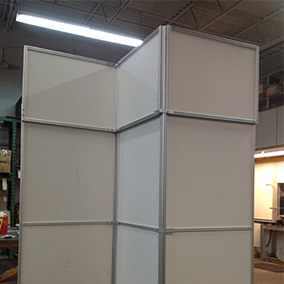 With our modular office partitions, you won’t have to pay a contractor to construct a sheetrock wall, that takes more time to set up, ends up being a lot more expensive, and can’t really ever be removed without requiring a lot more time and money to move it. 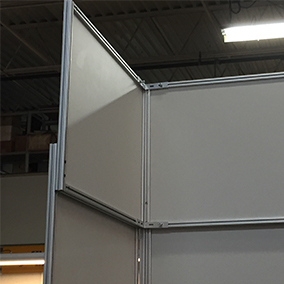 Our temporary office walls are affordable, while still having the highest quality and strength, that are simple and quick to set up – that you won’t find anywhere else. 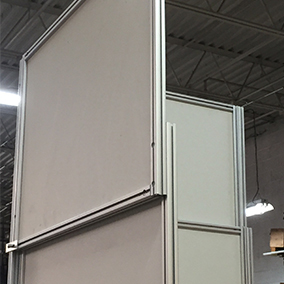 With our modular office walls, you will be able to maintain a structured and productive environment by having each team member with their own office, feeling in more control, more focused, and more productive to get the work done. 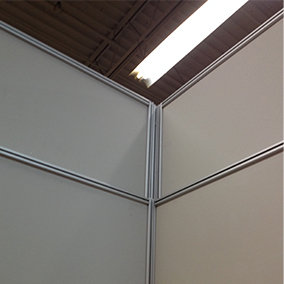 Traditional walls are nearly impossible to move to a new place in case you need to change your office location. 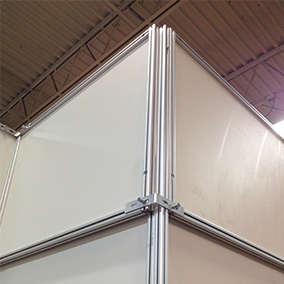 Thanks to their innovative design, Mallforms temporary office partition walls can be easily dismounted and carried to the new location to be assembled again – in any configuration. No mess, No fuss! #6: Safe – Mallform’s Walls Are Fireproof and Super Sturdy! 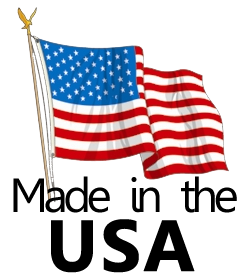 Our walls are Class A and Class III fire rated that meet the fire safety codes in the US. 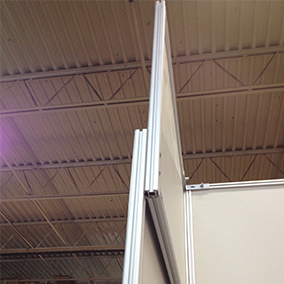 Our temporary office walls are safe and sturdy, and as mentioned, have been proven to stand the test of time. 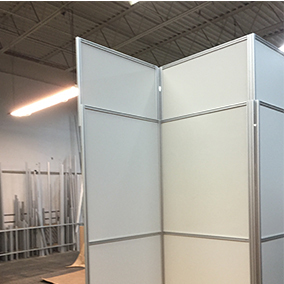 So if you’re looking for office partition walls that are the most cost effective, easiest and quickest to set up to configure to any situation you need – for more organization, increased productivity, and business growth, look no further than the Mallforms office walls. 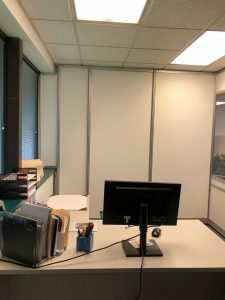 In order to start the process of getting your exact temporary office walls in place, just fill out the form below, to tell us what size you need, and we’ll send you the quote including estimated shipping to you right away. Start getting immediate productivity, and business growth the Mallforms office walls will provide for you and your staff. 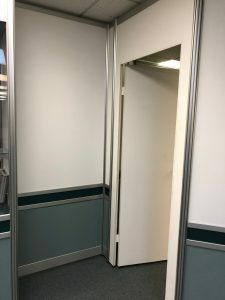 If you need your Mallforms Temporary modular office wall with a door and lock, please let us know – and we’ll include that in the price as well. And anything else please let us know, we are happy to help, and we are looking forward to talking soon.